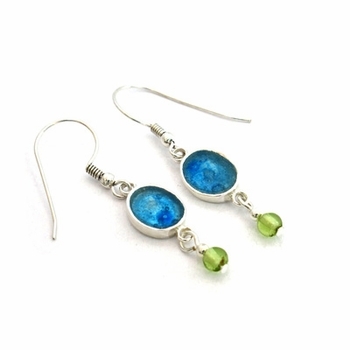 Genuine ancient Roman glass, handmade sterling silver earrings with special parts of Roman glass vessels. Created using an ancient fragment of Roman glass, aproximately 2,000 years old. Fragments of decanters, bottles and jars designed for pligrims who gathered oil, water or soil from the holy land. Pendientes unicos en plata y vidrio romano. Israel is one of the few locations in the world in which a series of geological and climatic phenomena coincide enabling the formation and preservation of the strikingly colourful glass. The fine Sterling Silver Roman Glass Jewelry is one of the most popular types and styles originated from Israel.